What’s this? 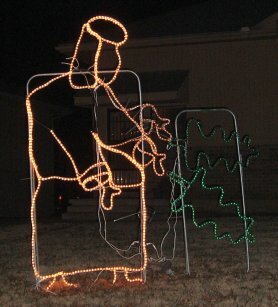 Why,it’s an animated Christmas light Jesus flogging. Frankly, I find this display a disconcerting piece of Americana. 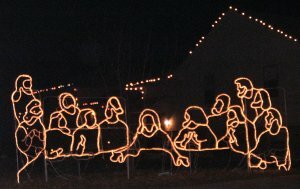 The above picture is part of an annual spectacle in Blue Springs, Missouri. 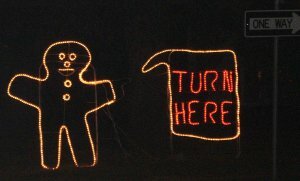 Guided by smiling gingerbread men, visitors drive through a subdivision and see lights that depict the life of Jesus–everything from his birth to his resurrection. At the end, a kid approaches each car with a donation bucket, rewarding contributors with a small candy cane. Weird, huh? The pictures below were made possible by the ever-patient J. Bubbles, who incurred the wrath of other sightseers by making frequent stops as we traveled along the route. What’s this? Is the rock moving? Wow – that is one of the weirdest things I’ve ever seen! 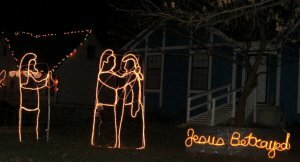 I wonder who gets Judas outside their porch for the whole of the festive season? Do you think it rotates on a yearly basis or are they appointed based on their popularity in the neighbourhood? Also, I don’t recall the part in the scriptures which said: “And lo, as Jesus was baptised a parrot came to rest on John the Baptist’s enormous breast.” Perhaps I wasn’t paying enough attention in class…. The real WTF is, WTF are you doing in Missouri? uh, I get the parrot, but what about the gingerbread man? is he to symbolize “run! run! fast as you can!” right before the betrayal? Happy New Year! Many wishes for a blessed, healthy, and successful 2005! Is it just me, or does the stone have a smiley face? And just when I thought I had seen it all. 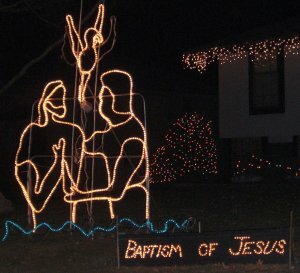 Oh please… but why would the story of Christ be untasteful at Christmas time? Are you guys that ‘out of touch’ with the Christian message that only happy thoughts are aloud? Please explain to me why you think it’s un-tasteful or disconcerting? It’s the flogging that I find disconcerting–the rest is just odd. Um. Well. Sure you don’t live in Mississippi? The gingerbread man was caught and eaten by the gator. Quite a discussion you’ve got going on this one. I’m interested to see that the whole community banded together for the display–and that their entire houses are in darkness–no lights on at the Inn–no other Christmas decorations (except for the ginger bread man enticing you towards scenes of flagellation). It is curious to see the stations of the cross–part of Easter and lent during Christmas and advent. 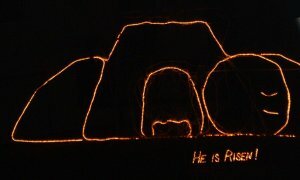 Do you think they display them at Easter as well? 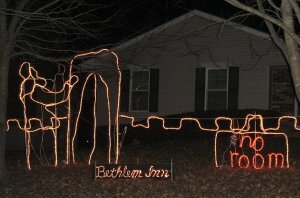 The manger scene and Inn scene are appropriate–maybe the other neighbors just needed more scenes, so they kept going. Nice post you typed there Z. Do you hug you mother with those hands? hey z my family and i are really impressed with the lights and the courage it took for these lights!!! 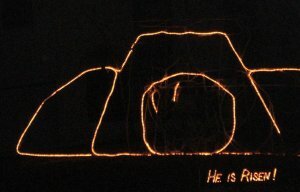 thank you for such a beautiful display, and GOD bless you and all the families involved with the lights. You dumb hicks, it’s CHRISTMAS, not EASTER! And I thought me blasting “Hark, the Herald Angels Sing” out on my car stereo during Hallow’een was a bit weird. I truly am disturbed by these though… shudder. I’m almost surprised there isn’t a crucifixion one, an ascension one… or some apocalyptic ones. I live 20 miles away. If only I’d known! 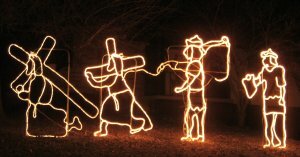 Who wouldn’t want to see Jesus flogged to lights? YeeHaw!! 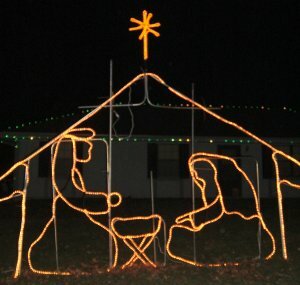 The life of Jesus is inappropriate to display during Christmas? It’s not Santa’s birth we’re celebrating, here! He would fit in there, wouldn’t he? 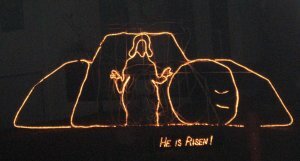 I feel sorry for the poor Jewish guy who got the resurrection scene in his front yard.